Beading pattern for the beautiful Drow Queen black flower pendant with blue crystal petals. Stay tuned about new art and new lessons! 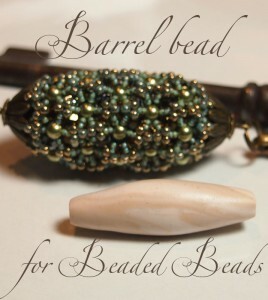 Beading tutorial, Beading tutorial for advanced bead weavers, Necklace, Pendant. Beading around a crystal, Beading pattern, Beading tutorial, Beading tutorial for advanced bead weavers, pendant tutorial. !!! 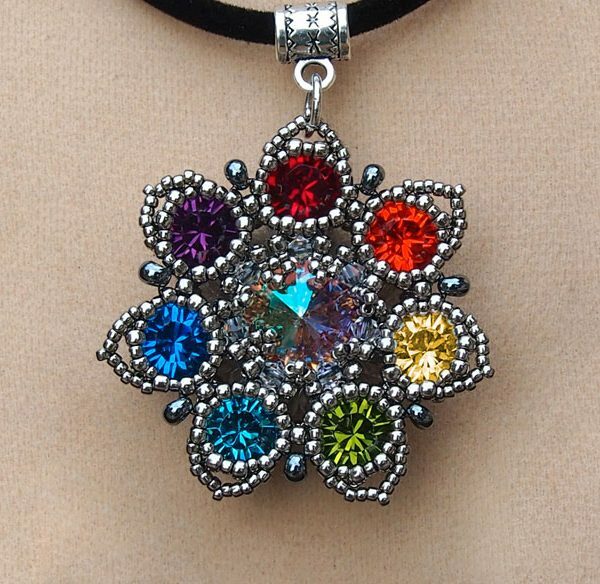 The tutorial contains instruction for making the DROW QUEEN FLOWER PENDANT ( ) and the SEVEN-COLORED FLOWER PENDANT.Both pendants have the SAME BEADING PATTERN. The difference is only in the colors of the beads and crystals (bicone crystals, rivoli and chatons). THE BEADING PATTERN CONTAINS THE COLORS OF BOTH PENDANTS. 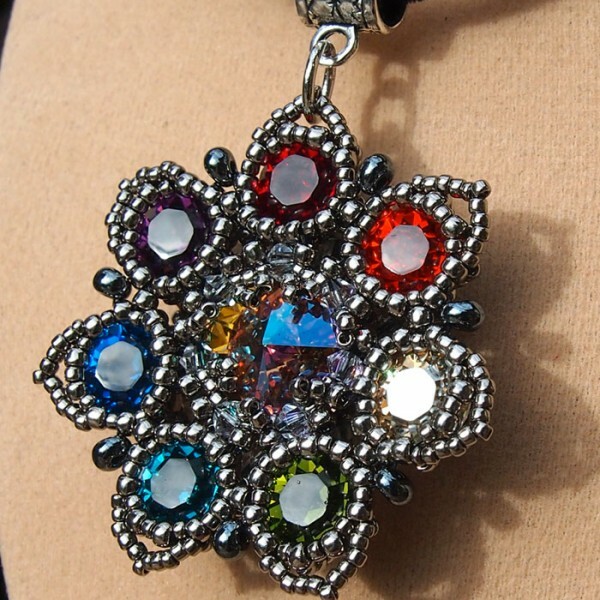 This listing is for a PDF file containing instructions for making the Seven-Colored Flower Pendant and the Drow Queen Pendant, not the pendants themselves. The beading pattern is very detailed. Step by step with illustrations of each step, material list, color list, and finished pictures of the pendants. Beadwork pattern for advanced bead weavers. Simple, elegant, easy to make beaded bracelet. The Sibyl Bracelet is a piece of the Sibyl collection. Beautiful white flower pendant with gold center. White Lady I. is the simple version with dagger beads and seed beads. White Lady II. is the version with Swarovski bicone crystals. 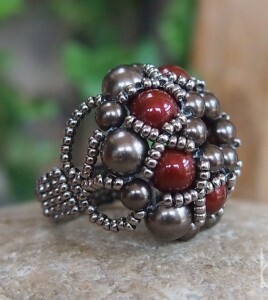 Easy beaded ring pattern with Swarovski Crystal Pearls and japanese seed beads. In this beading lesson I explain, how to make a triangle weave rope using tubular triangle weave stitch. You can use this stitch with different types of beads, this results triangle weave ropes with different appearance. 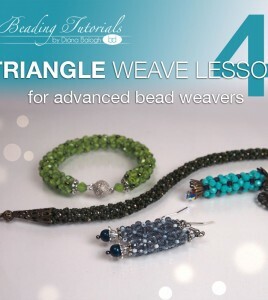 Following this tutorial you can learn how to make a triangle weave rope, and how to turn the rope into different types of beaded jewelries. 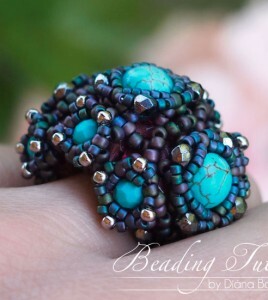 When I’m beading, I’m in the 5th dimension, which is a spaceless and timeless state, a.k.a CREATIVE BEADING.